The Corvette Chevy Expo is the vehicle to reach your audience! Do you have automotive parts from a restoration project you want to sell? Are you cleaning out your garage of old car parts and related items? Do you have a car related business and want to turn it into cash? If so, you should become a vendor at the Corvette Chevy Expo in Galveston, Texas. The Corvette Chevy Expo vendor spaces are all inside…no need to worry about rain or having to put up that tent! Anyone with car parts can participate in the vendor area at the Corvette Chevy Expo – businesses, hobbyists, and garage cleaners are all welcome. If you don’t have parts to sell at the Corvette Chevy Expo you can still be a vendor in our Commercial Vendor spaces. Click here for details. Do you make handcrafted items? We also have a Craft Show inside of the Expo. Learn more about participating in the Craft Show here. 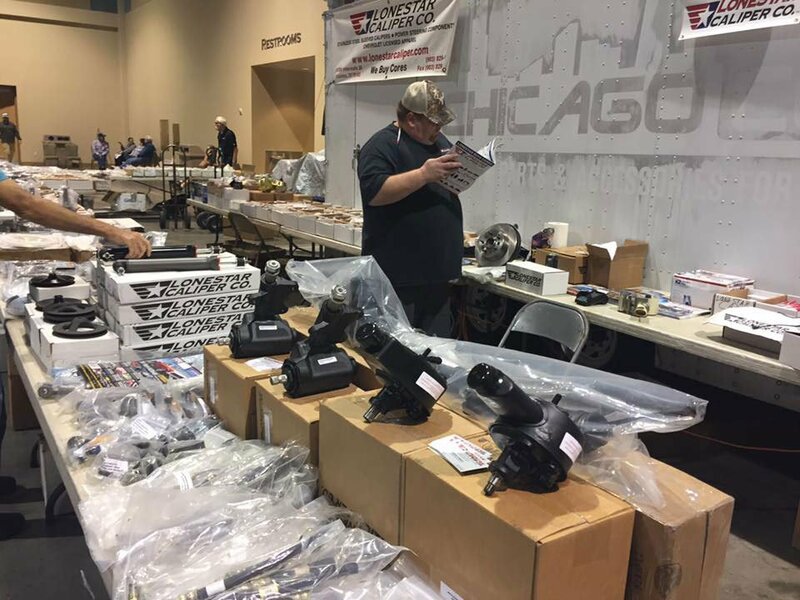 Parts Vendor Spaces are 10 x 20 and cost $310…(Corner Spaces are $350). If ordering a corner space, please call the office to check availability 386-775-2512. Each vendor space receives two-weekend passes. Early Bird Registration for the Corvette Chevy Expo ends February 2, 2019. It is $260 and after February 2 it is $310 for a 10 x 20 space. Thursday 9:00 am – 6:00 pm. We have two semis that come in at 9:00, so if you have a trailer, you might want to wait until later in the morning to arrive. Friday setup continues from 9:00 am – 6:00 pm. Move out is Sunday night after the awards ceremony…usually around 6:00 pm. The drivable show cars move out first, making room for your trailers to more easily move around. Most of the drivable cars are out of there within a half an hour or so. You may then move your trailers in to load. Thanks for your patience! We do extensive online and Eblast leading up to the event. We would love to help promote your products and announce your participation in the Corvette Chevy Expo. Please send press releases and photos to bonnie@corvettechevyexpo.com. For those who need to have the product shipped, we have arranged for everything to be handled by Truckers Dispatch Service. You will need to call them and make arrangements. Payment for your shipments will be direct to them.